Precision automation in mechanical engineering requires positioning systems which do not only work accurately and dynamically but which are also robust and reliable. Typical examples of applications are laser processing, 3-D printing, optical inspection, or scanning. PI (Physik Instrumente) now offers the particularly robust V-412 and V-417 linear stages for such fields of application. Special covers, for example, reliably prevent the intrusion of dirt or hot particles into the drive; purge connections are also provided which, in combination with the cover, can generate overpressure inside the housing. Industrial connectors with bayonet locks facilitate the assembly. The linear stages can be easily aligned during installation thanks to a specially-formed edge with a parallelism (//) smaller than 50 μm to the bearing guides or to the direction of motion. At 116 or 166 mm width, their load capacity is a maximum of 400 and 450 N respectively and the travel ranges of the series vary between 52 mm and 813 mm. At the same time, the linear stages position with an accuracy of a few micrometers and provide speeds of up to 2 m/s ensuring high throughput. They can be easily combined for multi-axis applications. Three-phase magnetic direct drives are used for these new linear stages. The ironless motors are particularly suitable for positioning tasks with the highest demands on precision because no undesirable interaction with the permanent magnets occurs (cogging torque). This enables a smooth running even at very low speeds. In addition, there are no vibrations at high speeds. PI has selected advanced motor designs that provide high forces, which expands the use of the smaller stages even with high accelerations and duty cycles. Position detection directly at the motion platform ensures that positioning is not influenced by backlash or other mechanical nonlinearities. The linear stages may be controlled by industrial automation controls from ACS, an international manufacturer of modern multi-axis motion controllers, who has been a part of the PI Group since 2017. Alternatively, the PI controller C-891 can also be used to operate the linear stages. Well known for the high quality of its products, PI (Physik Instrumente) has been one of the leading players in the global market for precision positioning technology for many years. PI has been developing and manufacturing standard and OEM products with piezo or motor drives for 40 years. 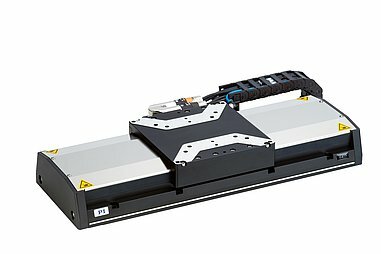 By acquiring the majority shares in ACS Motion Control, a worldwide leading developer and manufacturer of modular motion controllers for multi-axis and high-precision drive systems, PI has made a major step forward in providing complete systems for industrial applications with the highest demand on precision and dynamics. In addition to four locations in Germany, the PI Group is represented internationally by fifteen sales and service subsidiaries.